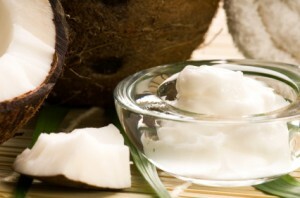 Coconut oil is ideal for removing makeup. It will dissolve your makeup and moisturize your skin at the same time, plus it delivers anti-aging benefits that your skin will just love. Quite a difference from the way soaps and detergents work! Plus it costs a fraction of their price. Skin care can be really simple. It is just a matter of using the right products. Natural products are packed with complex chemistry that will nurture and beautify your skin. Yet they are so simple to use. Coconut oil is a prime example: you can use it to remove your makeup and while, you do so, it will help to clear your complexion, fight off wrinkles, and keep infections at bay – all in one easy step. Coconut oil is one of the very best things you can put onto your skin. It is packed with easy-to-absorb, anti-aging compounds that reduce wrinkles and sagging, clear blemishes and liver spots, and restore the pH balance of your skin so you become less prone to breakouts. Removing makeup with coconut oil makes a lot of sense.. If you read more about the beauty benefits of coconut oil, you will see why at Gaelle Organic we include it in all of our products for rejuvenating dry skin. Great article! I have recently switched to using straight coconut oil as an eye makeup remover and it’s the best. You’re right – my skin gets a moisture hit at the same time… and no irritation! I also noticed that it seems to accelerate the healing of little blemishes on my skin. Thanks! Helps with the sun, too, I find. I’m confused why would you need to use soap if you are removing your make-up with coconut oil? I use soap all over, not just on my face. And I rarely use makeup. For those who do, coconut oil is a good way to remove it, and it has all these other benefits. I know people who use only coconut oil on their face – no soap. Sometimes, the feel of good soap is what you might want. It’s different from oil. But I agree, there is no need for soap if all you are using it for is to remove makeup.